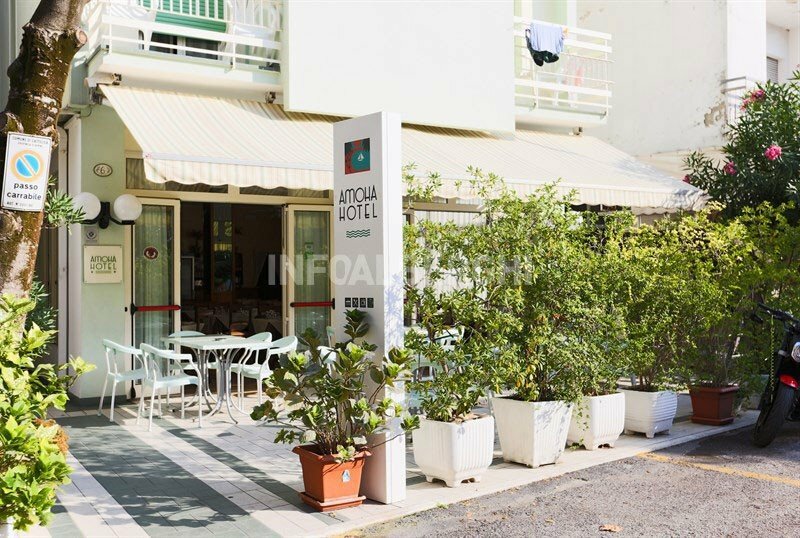 Hotel Amoha , a 2-star hotel in Cattolica managed by the owners, is situated in a quiet position and offers a familiar and welcoming atmosphere just a few steps from the beach and the pedestrian area. It has a bar, lift, parking, swimming pool at the beach and WI-FI internet access, including tourist tax. Admits free small animals. It is located in Cattolica a 5-minute walk from the beach, in a quiet area near the pedestrian area which, in about ten minutes on foot, leads to the center. On the opposite side you will arrive, always in a short time, at the Aquarium of Cattolica. The hotel is well connected to the Terme di Riccione by public transportation (bus stop nearby). The rooms have a balcony, ceiling fan, WI-FI, telephone, satellite TV, USB ports and a private bathroom with shower and hairdryer. The hotel has a open-air porch, terrace, hall, satellite TV room, bar, elevator. PARKING: free, covered and guaranteed, with shuttle service on request. CONVENTIONS: beach, INAIL / INPS, law enforcement, shuttle service for parking, organized excursions. BREAKFAST: sweet and savory buffet with homemade desserts, ring-shaped cake, biscuits, fruit, cheeses, cold cuts, fruit juices and hot drinks. LUNCH AND DINNER: 2 menus to choose between meat and fish, 2 side dishes with seasonal vegetables. VARIATIONS: vegetarian, vegan and gluten-free menus on request. In hotel: entertainment, baby / mini / junior club. On request: pediatrician e baby sitter. At the beach: entertainment, swimming pool for children, baby / mini / junior club. 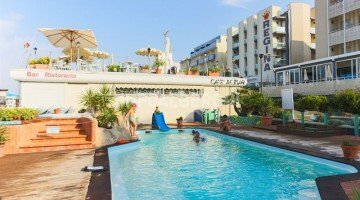 The hotel has an agreement with the Bagni Marcello of the bathing establishment n. 76 -77 with pool directly on the beach, children's playground area, entertainment, make-up for children. Prices are per day and per person, for a minimum of 3 days. FAMILY PLAN: 2 adults + 2 children (max 12 years, in room with parents) pay 3 adult rates. Super offer for families for stays in full board formula with drinks included with meals, prices per person from € 43.00 to € 74.00. Family Plan: 2 adults + 2 children (max 12 years, in room with 2 adults, with bunk bed), pay 3 units. - Family Plan: 2 adults + 2 children (max 12 years, in a room with 2 adults) = Pay 3 adult rates.